What better way to show that special person in your life that you love them than with a Love Heart Montage. This montage can feature up to 70 photos on one single canvas. It is shaped like a heart and we edit the layout to make sure you will be happy with it every time. Once the layout is done, we will email you a proof to approve. We will send as many proofs as possible until you approve the design as we know that this collage can be difficult to get right. Love heart montages make great gifts for Valentines Day, Birthdays, or even Christmas Day. 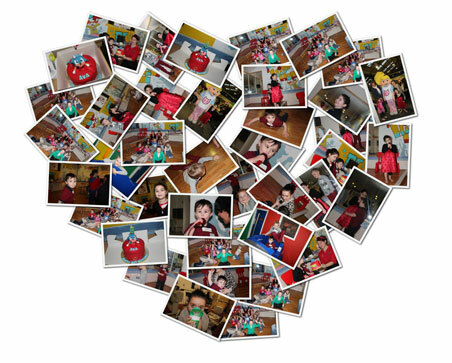 A Beautiful love heart shaped photo collage. You can have upto 70 pictures on this fantastic layout. Please send photos via usb pen drive or disk. Or if you prefer dropbox then please ask us for the link.